There is not a whole lot to get jazzed about in the survey conducted by the typically reliable Selzer firm. That isn't to suggest that this poll is not reliable. Rather, it is in line with other polls that have been in field post-convention. In that span, the trend has been toward the president with poll margin stretching out to as many as eight points. This Selzer poll, conducted for the Des Moines Register, however, is closer to where the FHQ weighted average has the Hawkeye state pegged at the moment. Another day, another Maine poll. The Obama share of support is consistent with the Rasmussen poll released on Friday while Romney's portion of the responses dipped a touch across the two polls. That impact is negligible as the FHQ weighted average stays put in the +14 Obama range. We're talking about a blue state here, folks. That said the congressional district split showed Romney within five points of the president in the second district. That one electoral vote may be borderline competitive in Maine's districted electoral vote allocation (see Nebraska's 2nd district in 2008). FHQ has said this many times, but I'll say it again. The data is nice to the extent we get new presidential line data in any poll testing the Brown-Warren senate race in the Bay state, but it isn't entirely necessary all the same. Massachusetts is blue. Enough said. The one exception to the calibrating/confirming rule is the Columbus Dispatch poll of the Buckeye state. There appears to be a little bit of a boomlet for Obama in Ohio in the last week or more. The last three polls released there have shown the president up by at least eight points. This Dispatch poll is also the fourth (of the six most recently released polls) to have the president up at least seven points. Now, is this a pattern that fundamentally reshapes the race? From a strategic perspective, a case could be made that moving Ohio off the board makes the electoral math hard for the Romney campaign. But the reality is that this is confirming poll in that it is confirming the movement in the president's direction; that any one of the earlier polls taken alone was not an outlier. This is a different kind of confirming poll, but it is a confirming poll, nonetheless. See Maine and Massachusetts on this one. Washington has had its moments threatening to jump into the Lean Obama category in 2012, but that has never fully manifest itself. 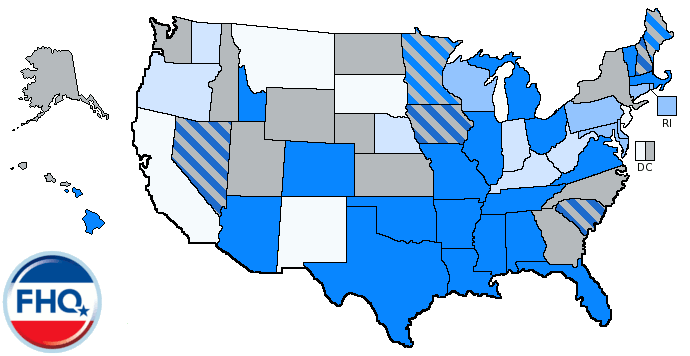 The Evergreen state is pretty blue. The new Rasmussen poll of the state does little to deviate from that conclusion. Looking at the map and Spectrum, what held true on Friday hold true again today. It is a status quo day. The electoral vote tally has not budged. Truth be told, it hasn't moved since FHQ began tracking the state polls back in July. 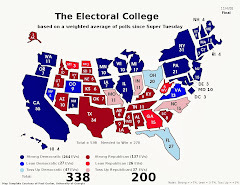 There has, however, been movement on the Electoral College Spectrum. Mind you, this was small movement involving states that are not really in play anyway, but it is movement all the same. Massachusetts traded spots with Illinois. See, a small move, but one worth tracking. As for the Watch List, well, on a day when the polls released did not do much in the way of moving the needle, the list remained untouched. 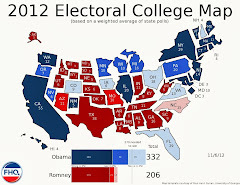 It is still all about North Carolina (Florida) and the quartet of Lean/Toss Up states that the Obama campaign would rather like to keep where they are. As FHQ mentioned via Twitter earlier this week, life (and death) and a not all that unexpected uptick in the frequency of polling releases have formed a perfect storm of delay around here. Very simply, I'm behind. However, FHQ will be in catch up mode this weekend. 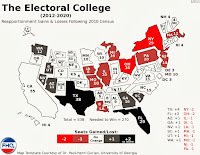 To the extent I can churn them out, you will see a semi-steady stream of outdated updates to the electoral college map starting with the survey data released on September 20. I sincerely hope to be fully updated by Monday and then rollout a map with redefined (constrained) categories on Tuesday; just in time for the debates. 1) The "strong" category will shift from being states with averages over 10% to those above 9%. 2) "Lean" states will now be those with weighted averages between 4-9% instead of between 5-10%. 3) Most consequentially, "toss up" states will be those with averages below 4%. Finally, let me apologize for the slowdown in posting and thank you all for your patience as we bring things back up to date.